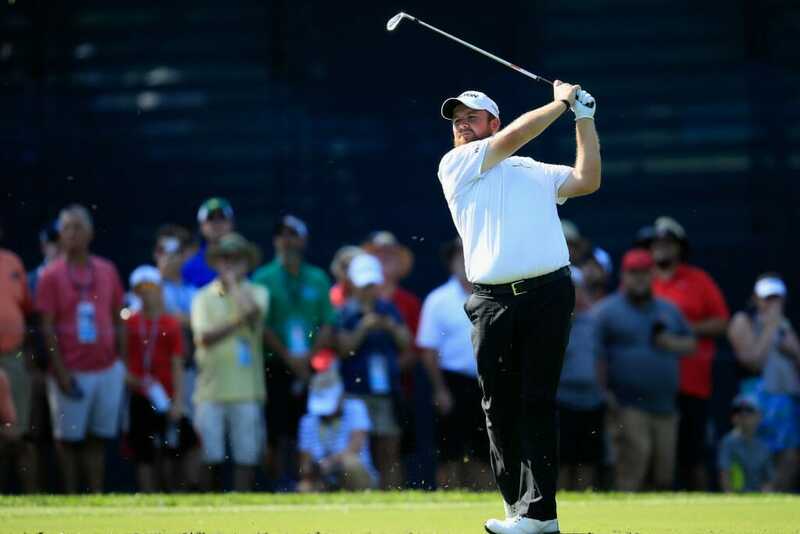 Shane Lowry has brilliantly muscled his way into Bellerive victory contention with a carrer low score in the Major’s in shooting a sizzling second round 64 in the storm-affected PGA Championship in St. Louis. Lowry didn’t drop a shot his his six-under par showing to offiicially end the round at seven-under par, sharing sixth place in the year’s final Major. It left Lowry trailing just three strokes behind American Gary Woodland who set a new 36-hole opening PGA Championship low in leading at 10-under par. Double PGA winning Rory McIlroy, who restarted his round on the eighth fairway, birdied two of his closing four holes in an eventual three-under par 67 for a share of 25th place with a similar two-round total. Lowry’s effort is his lowest round in 23 Major Championship’s since a final round 65 to finish T9 behind Rory McIlroy in the 2014 Open Championship at Royal Liverpool. Also, it is Lowry’s lowest score in 20 rounds of the PGA Championship and three shots fewer than his 67 on day four of the 2014 PGA at Valhalla. The Offaly golfer was among half the field called from the course at 3.30pm local time Friday due to impending storms and then when play was suspended some two hours later it meant Lowry and his colleagues resuming play at 7am local time Saturday. When the siren sounded to restart play Lowry easily found the fairway with a near 200-yard rescue club on route to making par and then holed a monster 21-footer for birdie at 12 to move to five-under and to six-under par in sinking a 10-footer at the par-3 13th. He missed the green some 40-yards left at the par-5 17th but a chip shot to 13-feet and a sixth birdie of his round moved a clearly delighted Lowry into the top-10. “I played nice. I didn’t think we were going to get called yesterday, and I was going along lovely so I was probably a little bit disappointed but then I did get a good night’s rest,” he said. Lowry had set his alarm for 4.45am but said he turned over and went back to sleep but fortunately he’d set his mobile phone for four different time alarms. Lowry was headed after his round straight back to his hotel for a well-earned shower and an early lunch ahead of tackling the third round in the continuing oppressive sauna-like conditions. His prior best finish in the PGA Championship was T46th in 2014 while he’s only made the cut in three of his six prior PGA appearances. Of course, Lowry’s best finish in his 22 showings in the Majors was runner-up to Dustin Johnson in the 2016 U.S. Open at Oakmont, so he’s no stranger to a lofty finish in the Majors. And after an indifferent season in which he’s played 22 events on both sides of ‘The Pond’, managing a best of T14th in the Houston Open, Lowry knows the worth of a strong St. Louis finish. Missing the halfway cut was former PGA winner, Padraig Harrington with scores of 81 and 70 and also missing the weekend is Paul Dunne after a pair of 73s and the duo have plenty of company with the weekend off in being joined by Major winners Sergio Garcia, Patrick Reed, Phil Mickeson, Henrik Stenson, Danny Williett along with Ryder Cup aspirants Matt Kuchar and Paul Casey.